This week (Aug. 1-7) is World Breastfeeding Week, when organizations around the world mark seven days for the promotion, protection and support of breastfeeding. This year, the theme is Breastfeeding Support: Close to Mothers. I love this theme, because from what I have experienced personally and what I have seen my friends experience, true support and information is what women need to have a successful* breastfeeding experience. Instead of telling you all the reasons why I think breastfeeding is absolutely amazing, I thought it would be more useful to tell you why I was able to breastfeed for almost 15 months and counting. Before I was very far along in my pregnancy, I read La Leche League’s The Womanly Art of Breastfeeding. Although I didn’t always agree with everything in the book, it did give me a sense of the possibility of nursing my child exclusively and long-term, and gave me a lot of information of what was to come. In addition, I went to two La Leche League meetings before my son was even born. I felt awkward the first time being without a child yet, but knowing the leaders and some of the moms made for a much easier meeting the first time I was there with a hungry infant and tons of questions. Breastfeeding is natural, but that doesn’t make the first days any easier. For many women breastfeeding is difficult, painful at first and simply frustrating. So I armed myself with patience, and thought that walking and talking are also natural but we have to learn to do it first! When breastfeeding didn’t go well at the hospital, I told myself to relax and expect the next day to get better. I had to do this every day for the first couple of months, but everyday things did get just a little better. Full disclosure: at the hospital I had to give my son a couple of bottles of formula because his blood sugar kept dropping to dangerous levels. I tried to nurse and pump constantly and always offered him my breast and what little colostrum I was able to pump before giving him the bottle. I hated doing it, but I had to make a decision and I stood by it without guilt. 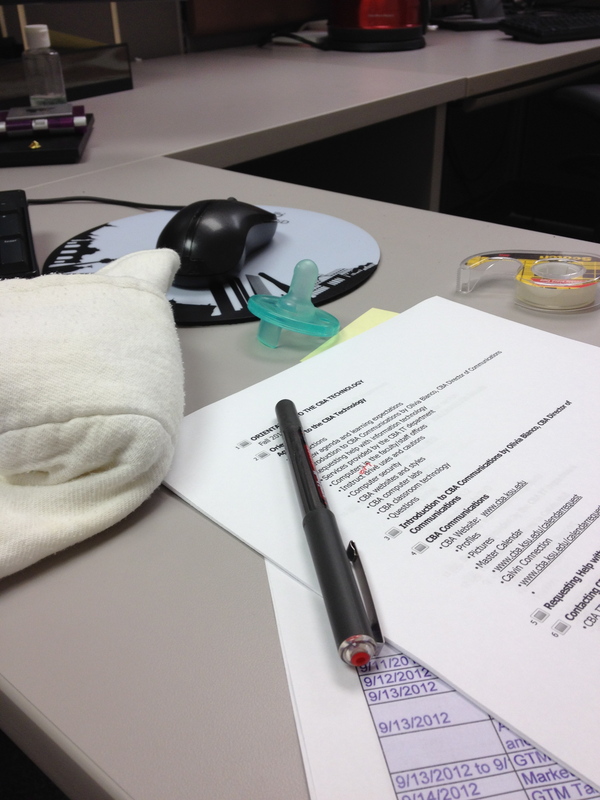 Being able to bring my son to work – when he was still sleeping most of the day – made nursing him easier. I don’t have my family near by, and my closer friends did not have children at the time. So I made sure to get support from other people who I knew would help me achieve my goal. These were not necessarily close friends or family, but they provided me with what I needed at the time- a listening ear and gentle suggestions for improving my experience. I have seen many situations where a new mom wants to breastfeed but at the first signs of difficulty, well-intentioned friends and family encourage them to bottle feed. This does not ultimately help the mom, or the child. I know many moms feel disappointed and guilty for not having achieved what they had wanted. Being a mom is hard enough without having these feelings! My support system became my sister, who lives more than a thousand miles away from me but has nursed 4 children for more than a year each and made time to talk to me on the phone, the La Leche League leaders and moms who I knew I could count on, and my husband, who never once encouraged me to feed our son formula in exchange for a better-rested wife. My workplace was also supportive of my needs as a working mom. The last and perhaps most important part of my successful experience, was making breast milk the only option in our home. I gave away all the samples I received at the hospital, and for the first week – and at the recommendation of a very helpful La Leche League leader – I sat on my couch with a comfortable shirt on, my son and nothing to do or worry about except feed him. I nursed him as long as he wanted to, as often as he wanted, and let him sleep in my arms. It was not only a wonderful way to recover from birthing him, but a great way to get to know each other and get my milk supply going. Going back to work after a 3 month maternity leave posed some new challenges, including a tense relationship with my very expensive breast pump, and someone walking into my office during a pumping session. I never relented on my goal of breastfeeding exclusively for 6 months and continue for at least another 6. Now that we are approaching the 15th month I know that it did get better in the end. There are many other things that made breastfeeding possible for me, including the fact that I have a job that offers flexibility and a private place to nurse or pump. Breastfeeding is not easy, especially for women who work in places that don’t offer these benefits. But the law is in women’s favor when it comes to nursing your children, so if you want to do it, learn about your rights and get ready to learn how to nurse your child. *I consider my experience to be successful because I made it to my goal of breastfeeding for a year and beyond. But you are the only one who can measure your success.